Stylish apartment located in historic Apsley Village, ideally located for exploring the Hertfordshire countryside and the delights of central London. The apartment is closr to the Harry Potter Studios and opposite the Grand Union Canal and a beautiful marina, and 15 minutes walk from Apsley Village with its boutique shops, restaurants and pubs. Hemel Hempstead town centre, shopping mall and the historic city of St Albans and Watford are within easy reach. Central London - 20 mins away by train. Warner Brothers Studio Tours (The making of Harry Potter) - 15 mins away by car. Ascot - 60 mins away by car. Hemel Hempstead Town Centre - 5 mins away by car. The Snow Centre - 10 mins away by car. Verulamium Park & Museum - 20 mins away. The Rex Cinema - is 20 mins away by car. The construction of the trunk canal (later to be called the Grand Union Canal) between London and the Midlands through the valley in 1798 that began its industrial rise at the start of the 19th century. The canal gave an easy way of transporting the raw and manufactured products to and from the mills. John Dickinson, the inventor of a new method of continuous papermaking, purchased an existing mill in the area in 1809. There is record of paper making already taking place nearby at this time. John Dickinson, the inventor of a new method of continuous papermaking, purchased an existing mill in the area in 1809. There is record of paper making already taking place nearby at this time. Streets of mill workers' terraced houses grew up adjacent to the mills. Housing for managers was built on the old Manor Farm, higher up the hill towards Felden, in the grounds of the Manor Estate, today known as Shendish Manor. 1938 – Apsley railway station was built with backing from John Dickinson Ltd as a way to bring more people to work at the Mills. 1853 – Charles Longman, heir to the publisher Longman's and partner to John Dickinson, bought the Shendish estate and built an impressive manor house. St. Mary's Church (1871) stands above the modern Sainsbury's supermarket in Apsley. It was built to serve and inspire the workers of the paper mill that once occupied the supermarket site. I am am an entrepreneur working within the legal profession in Dubai. I take pride in the properties that we let out as holiday lets and like guests to have a "home to home" experience. This is evident from the carefully selected furniture, tasteful decor and the personal attention our managing agents in the UK and Cyprus offer to guests visiting the properties. We like to exceed expectations and see guests return after a pleasant and memorable holiday. The property was initially purchased as a home and is now an investment and holiday home. 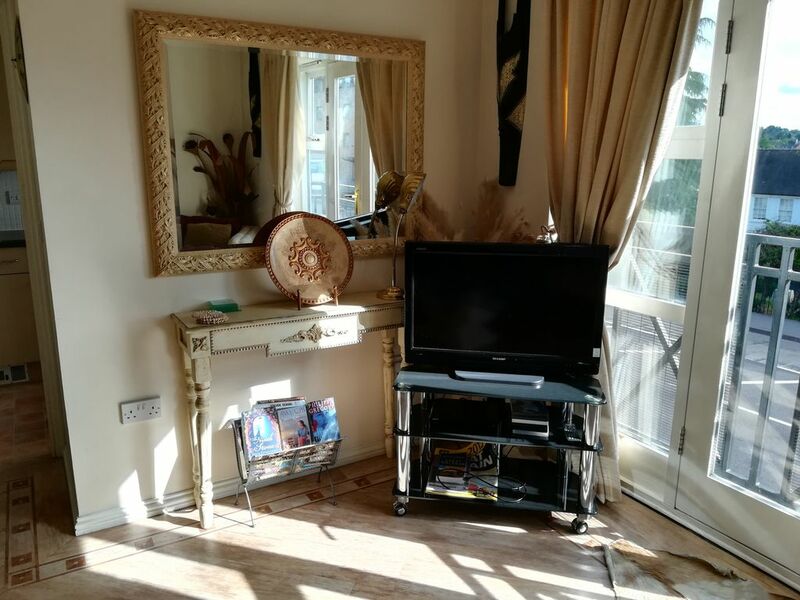 The quiet village environment, the convenience of having restaurants, supermarkets, churches and DIY stores within a stone throw from the property will make this property very attractive to renters. It is also conveniently located and is 30 mins from London and Milton Keynes. Apsley village offers easy access to London by train and to the northern parts of the UK. There is a train station just 2 mins walk from the property. Nice and quiet neighbourhood, occupied by several professionals who live in the area. Beneficial for receiving visitors as there are restaurants, pubs and hotel a short walking distance from the property. The canal that runs through the Apsley Lock development and the marina across the road from the property, gives the area its unique feature. The property is very popular with local and overseas renters and is often booked out months ahead and throughout the year. Large bathroom, bath and shower unit, vanity unit. Apartment is part of Apsley Village, Hertfordshire. Separate living room, tastfully decorated, very comfortable, soft furnishings which give a very warm, comfortable and homely feel to it. Baby Grand Piano, DVD player, video recorder, digital colour TV, telephone, internet and printer provided. Overlooking lounge and views of Apsley Lock and Grand Union Canal. Shendish Manor golf course is a short drive away and can be seen from Apsley train station. Notes on accommodation: The apartment is not suitable for children (owner permits babies and toddlers at her discretion) A higher damage deposit will be required. Apartment not suitable for the disabled. Pets and smoking are not permitted. Outside: Communal gardens and allocated parking. Sainsburys supermarket, Currys, the Holiday Express Inn Hotel, country pubs and a variety of restaurants (Indian, Mediterranean, Vegetarian, delicious home made dishes at the Paper Mill) are very close by and within 5 minutes away. Utility Room: Incorporated into the kitchen. Cleaning / Towels / Linen / Maid service: Linen, towels and toiletries are provided. Other: Very quiet and secure development and easy access for travel by road and railway. Apsley train station is 2 minutes walk from the apartment. Beautifully decorated apartmemt, very comfortable and homely. Excellent location. Very good, best holiday home in the area. Very nice neighbour hood and quick walk to the station for central London. Hemel Hempstead and Apsley Lock area, in addition to the convenience of travel to London and tourist sites in the area. Many thanks Andy, I am glad you enjoyed your stay. I look forward to welcoming you as a guest again in the near future. Easy travel by train into London, the South East and North England i.e Liverpool, Manchester, Scotland, Preston, Birmingham etc. There are leaflets and brochures of historic sites and places of interest in the apartment. Tourists Attractions: Skiing in Hemel Hempstead: The Snow Centre Hemel Hempstead. The perfect slope, the perfect snow, the perfect location; this is Britain's brand new indoor snow sports destination. Designed to deliver the alpine conditions every skier and snowboarder dreams of, you'll find a huge 160m main slope as well as the largest indoor lesson slope in the UK. Britain's premier indoor snow sports destination - The Snow Centre Hemel Hempstead. Harry Potter Warner Bros Studio Tour. The Garden of the Rose. Go-Ape Wendover: The UK’s number one forest adventure. Days out with them are about living life a little more adventurously, having fun with friends and family and getting in touch with your inner Tarzan. The Go-Ape Wendover experience is a 2-3 hour tree top adventure. You will be briefed for your safety before you fly down their zip wires, leap off their Tarzan Swing and tackle their crossings whilst enjoying some of Wendover's most breathtaking scenery. It is 30 minutes away, just off the A41 on the B4009 towards Wendover. Boxmoor Hall, Hemel Hempstead: Why not relax in the stylish lounge bar at Boxmoor Hall for a relaxing drink? Or host your special occasion, wedding, or corporate event here in one of our beautiful rooms? Shopping at Riverside Shopping Centre in Hemel Hempstead: Riverside is the new open-air shopping development that is set to bring a vibrant and exciting shopping experience to the heart of Hemel Hempstead. You will be surprised at Hemel Hempstead's thriving town centre shopping in The Marlowes Centre, with this Riverside development bringing Debenhams, TK Maxx, H&M, Monsoon and many more to the town. Out of town shopping includes superstores such as: Tesco, Sainsbury's, B&Q, Homebase, Staples, Halfords and Currys. Theatre & Comedy Gigs: The Hemel Hempstead Old Town Hall Box Office. Call: 01442 228091. Main Theatre - excellent fringe theatre presentations. Cellar Club - Gigs, comedy. Beauty salon close by in Apsley Lock that offers hair dressing, beauty treatments, massages and body treatments at reasonable prices. Ice Skating in Hemel Hempstead: Planet Ice, Leisureworld, Jarmans Park: Silver Blades themed ice rink. Call: 08458 725 799. email: info@hemel-aquasplash.co.uk. Swimming in Hemel Hempstead: Jarman Park Swimming Pool: Aquasplash indoor tropical water park with space bowl, super flume, tyre ride, drag race, multi slide, falling rapids and lazy river. Call: 01442 292203. email: aquasplash-hemelhempstead@luminar.co.uk. Hempstead XC Centre - extreme sports centre, BMX and skateboard park, rock climbing and pot holing. Sports Centre in Hemel Hempstead: Dacorum Sports Centre, Park Road, Hemel Hempstead. Fully accessible for people with mobility problems. The new facilities include a swimming pool complex consisting of: water confidence pool (with moveable floor to aid teaching), 25-metre competition pool, diving pit, outdoor seasonal 25-metre pool, outdoor bubble pool, outdoor paddling pool area. All outdoor pools will be open from mid-April through to mid-October. Call: 01442 228188. Fitness Centre in Hemel Hempstead: Sportspace Fitness Centre has 50 strength training, cardiovascular, and circuits machines, steam room, sauna, large aerobics studio with sprung floor and sports cafe. Crazy golf, giant chess and draughts, bowls, petanque, croquet, kids paddling pool (May to September) and picnic area and tables. Athletics Track in Hemel Hempstead: Dacorum Athletics Track, Jarman Park, Gadebridge Park, along the Leighton Buzzard Road. Hemel Hempstead. Providing athletics facilities. SPECIAL OFFER Repeat Visit Packages in the same or following year (s) - 25% discount on standard rates (minimum stay 7 nights), complimentary dining for two funded by owner worth GBP 70 OR luxury welcome pack on arrival. Concierge service on arrival. BOOKING NOTES Booking enquiries must be directed to the owner via email or telephone. Arrivals: Guests arriving after 6pm (UK time) must collect keys from residence of our House Keepers. Please contact them for directions. Changeover Day: Flexible changeover. Guests must avoid arriving after 8pm. Notes on prices: Prices quoted are inclusive of all bills, unlimited use of WIFI and free parking. Parking A refundable damage deposit of 300 Pounds Sterling will be required for your booking irrespective of the length of your stay, in addition to the rental price. Guests are expected to leave the property as tidy as they found it. Guests must only take their belongings with them on the day of departure. The cost of replacing any missing items and the time taken to do so will be deducted from the damage deposit. The property is as advertised and the photographs are a true reflection what a renter should expect. Charges will be made and payable to owner's agent directing for private viewings of the property prior to occupation.